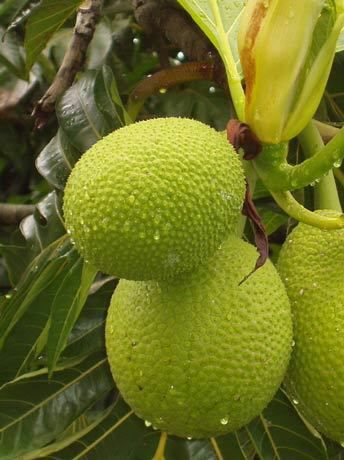 The breadfruit was introduced into the Antilles by William Bligh (1754-1817), who brought it back from Tahiti. The first attempt to introduce the tree failed due to the 1789 Mutiny on the Bounty, and the second attempt led to its introduction in Saint-Vincent in 1793. French botanists place this valuable tree in the jackfruit genus (Artocarpus), trees in the fig family, of which the leaves are single, complete or lobed, with very small, incomplete flowers, as the male flowers do not have a corolla and the others do not have a calyx. All flowers grow on the same tree, towards the end of the branches. The few species found in this genus are remarkable, either by their organisation or by their characteristics. The lobed-leaf jackfruit is the true breadfruit, a plant made famous by voyages to Oceania. Expeditions were organised to obtain a few plants of this valuable tree in order to supply the former English colonies and the New World. Some of its fruit do not have stones: trees on the island of Tahiti produce no other type; but more rustic varieties that still have jagged stones, almost as big as chestnuts, are found on other islands of Oceania. The breadfruit produces fruit for eight consecutive months. When choosing fruit to eat fresh, look for fruit that is mature with mealy pulp, a state that can be recognised by the colour of the peel. Leaves 30 to 60 cm long, with deep lobes, arranged in spirals. Leaves (like the trunk) ooze a milky liquid if split. Flowers Unisex, grouped into fleshy inflorescences. This species is pollinated by the wind. Fruit The fruit is an agglomeration of several fruits. It is round, oval-shaped and measures 10 to 30 cm long. Its skin, covered in spines, is green-yellow at maturity. The fruit contains few pips. The (edible) flesh is the flower that has not fructified. Breadfruit is eaten when it is ripe, meaning when the white milky sap comes to the surface and runs on the outside. The fruit is still hard and green. If the fruit is left to ripen, part of the starch it contains will change into sugar. It will then have a sweet flavour and must be used while it is tender, before it rots. Its seeds, leaves and flowers are also eaten. The seeds have a pleasant, nutty flavour. The leaves can only be eaten when they are very young. If the flowers are picked at just the right time, before they turn brown and become hard, they are also edible. This starchy fruit is used in a variety of ways: in gratins, purées, fritters, croquettes, fried, soups, soufflés, "migana", "bébélé" (a speciality of Marie-Galante), etc. The basic way to prepare breadfruit is to boil it with salt to accompany meat or vegetables. In baking, its flesh is used to make cakes and flour. Candied breadfruit using with sugar is a soft sweet. Breadfruit contains lots of energy. Starch and sugar make it a high calorie food. It is also a good source of vitamin C, which strengthens the body's tissues, helps it to assimilate iron and supports the metabolism. In addition, breadfruit is rich in the fibre, needed for good intestinal transit. People who eat foods rich in fibre are at a lower risk of becoming overweight or obese. The seeds of the breadfruit are a quite good source of protein, which the body needs for growth and good health. Breadfruit seeds are full of vitamin B1 (thiamine), which helps the body to convert carbohydrates into energy and heat. Breadfruit leaves are a good source of vitamin C, iron and calcium. Iron is good for the blood and calcium helps build strong teeth and bones. Average calories and nutritional value in grammes per 100 grammes: Kilocalories 90 - Proteins 0.9 - Carbohydrates 12 - Fat 0.5.